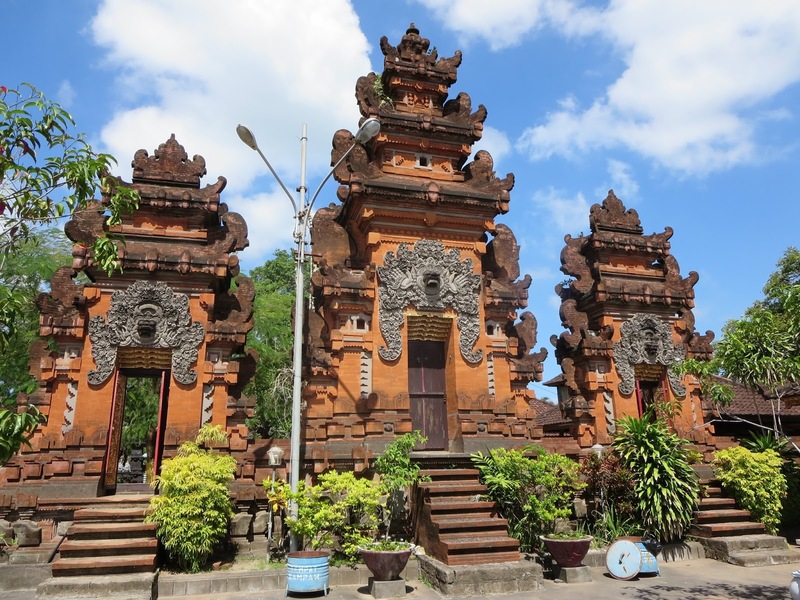 Petitenget Temple, referred to as ‘Pura Petitenget’ by locals, is a significant, centuries-old temple in Bali and one of the very few cultural landmarks at the island’s upscale beach resort area of Seminyak. Somewhat overshadowed by the modern developments of lavish five-star resorts in the area, this temple still remains an important highlight and a must-see while in Seminyak, especially during its festive 210-day anniversaries and the traditional dance rehearsals regularly held by the locals in a grand pavilion nearby. Red bricks and sandstone make up most of the temple’s architecture, giving it an antique feel. 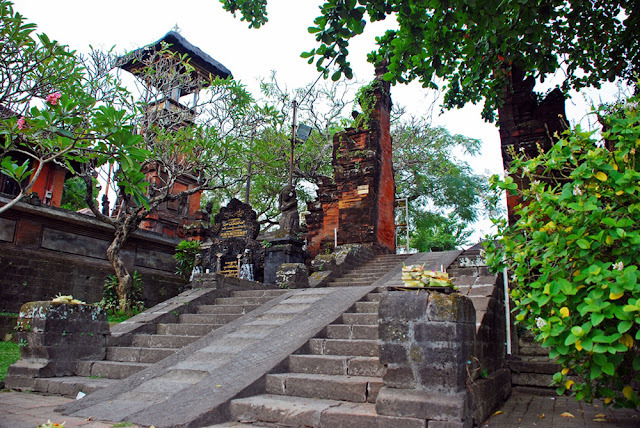 Up the dragon staircase is the temple’s vast courtyard, where a dozen different shrines and small pavilions draped in typical Balinese chequered cloths create an eerie and hallowed sight. Petitenget forms one of the island’s Dang Kahyangan collection of sea temples that spiritually guard the island’s perimeters, initiated by the legendary Hindu priest Dang Hyang Nirartha on his historical mission from neighbouring island Java in the 16th century. Despite having a rather secluded location, hidden away behind the rows of glamorous designer boutiques and fine-dining restaurants, getting to Petitenget Temple is easy. 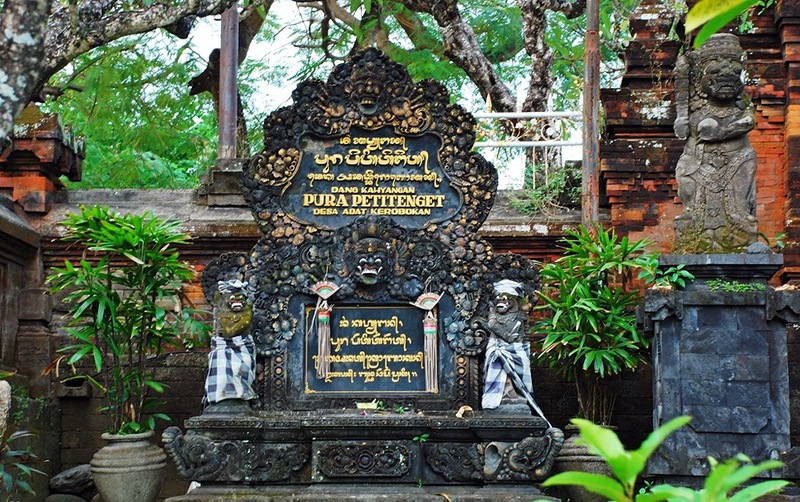 Jalan Petitenget is within a half-hour transfer from Ngurah Rai International Airport in Tuban, and can be accessed from the north via Sunset Road and Jalan Raya Kerobokan, and from the south via Kuta and the main Jalan Raya Seminyak. The temple resides at the main junction where Petitenget restaurant bears its name clearly across its white picket fence. Motorists approach through the southern entrance where parking tickets between IDR 2,000-5,000 usually apply, and proceed to the large parking space. The temple is immediately to the right, and if you come on weekend mornings, the grand Bale Agung pavilion across from the temple usually features dance rehearsals featuring young Balinese girls practicing their moves and articulate gestures. The front of the temple is leafy and well-shaded by large old trees, some perhaps matching the age of the temple itself. The popular street and namesake of the temple, Jalan Petitenget, is lined with world-class dining and entertainment venues and connects to Seminyak’s other famous dining streets of Jalan Batubelig, Jalan Kayu Aya and Jalan Laksmana at its southern end. Among the popular venues frequented by visitors and expats here are La Lucciola, Ku De Ta, Potato Head Beach Club, Hu’u and Motel Mexicola that is snugly located on a side street called Jalan Kayu Jati. Only several meters from the temple and over a wooden bridge, is the fine stretch of golden-grey sand of one of the island’s most gorgeous sunset beaches.